I’m having a terrible time writing a reflection for Palm Sunday. I’ve been trying to come up with a good idea, but everything I come up with seems trite, too “pious.” Consequently, all kinds of unhelpful things are cluttering up my mind. Like what? Like: When I was a kid and the Mass was all in Latin, was the Gospel read in Latin? Was that why it seemed so l-o-n-g? Like: I wish I’d never said yes to writing this blog. But, I did. So here’s my one slender thread of a thought. 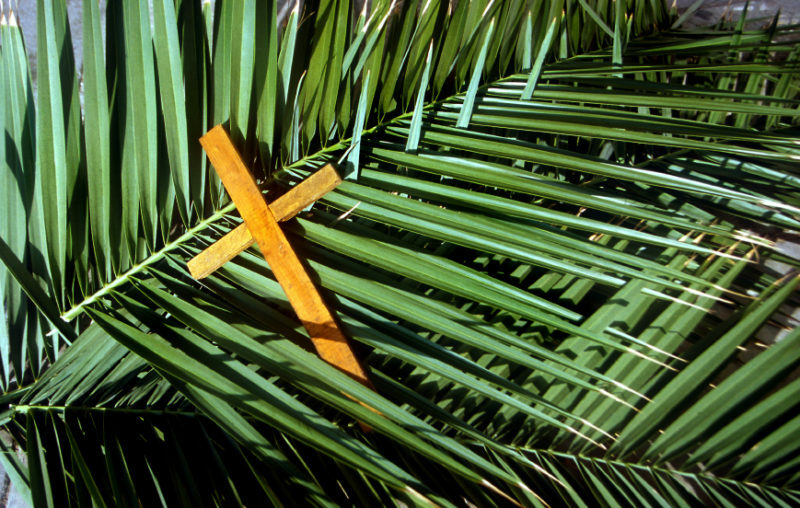 Does Palm Sunday mark the beginning of the last chapter in the life of Jesus? Or does Palm Sunday mark the end of believing that there is a last chapter in the life of Jesus? Or in the life of any of us? This is so real and so you/us/all/Cosmic Christ, Denise. It will take me longer than all of Holy Week to answer your penetrating question with my life. For that I thank you. Bishop Sheen’s famous quote: Communism lives the cross without Christ and the West tries to live Christ without the cross. We need to live Christ WITH the cross. Palm Sunday reminds me that everyone cheers Christ when things are going great, but when things get rough, we often fail to embrace the cross. Embracing the cross – sharing it with Jesus shows our faith, hope, & love. I would go with your second question….I would like to believe it is the end of thinking this is the end…but it seems to take an affirmation of faith each time, again and again. Thank you for asking such a good question! Beautiful. Gave new meaning to Palm Sunday and a little thrill of joy instead of hopelessness. The second question gives me place of meditation/mindfulness for this week. It’s simple enough for me to recall, perhaps written on a scrap of paper and carried in my pocket. It’s a hope filled question, as, I think, do the overwhelming catastrophic events, school shootings, Notre Dame Cathedral burning,, our government in free fall, are these events last chapters? Is it the last chapter in a 1st grader’s life? Or can I walk with Jesus in trust, that’s it’s not? Can a Cathedral be rebuilt to reflect the history but also the future of our faith, Can our government finds it’s way out of this lack of integrity and leadership? The third day of the Tridium leads me to believe these are not last Chapters, and to reflect how do I live during the journey? Thank you sister Denise, for the meditation! All the memories and feels of the first few paragraphs lulls me into commiseration — uh-huh, me too, yeah it’s just like that … and the BAM! The question posed at the end knocks my socks off. So glad I read this tonight. Thank you for writing and posting it.